Years ago my aunt gave me a recipe for roasted tomato soup that called for beefsteak tomatoes, which, truly, are only available in good form in the summer. I made it several times, because, who are we kidding? I can eat soup on a hot day. Especially if it’s tomato soup. It’s a weird thing I picked up from my mentor at an internship eons ago: great soup (say, with a bagel) was filling – and cheap. It became a ritual. What can I say? I’m a creature of habit. After I left that organization I needed to recreate the soups that got me through the simultaneous reaffirming and heartbreaking work (and gave me super human rights powers? ), and this recipe, which I did only make in the summers, was spot-on. But the heat from the oven, and then the stovetop, was generally intolerable, so after a while that hand-written recipe left the rotation, relegated to the inner folds of my recipe binder, several pages down from two different summer-y panzanellas and nestled between two decidedly wintry soups. It’s been humid and relatively warm these last few days, but that deathly still summer air is gone, the threat of freezing temperatures imminent, and thankfully, tomatoes can still be procured at our local farmers markets. They’re not especially perfect, not like they were at the height of tomato season, but bruised, imperfect fruit is always great for cooking anyway. Plus, they’re often sold at a discount since they’re not as pretty as they used to be, and the crop is likely on its last legs. It was also due to be stormy here in New York yesterday. 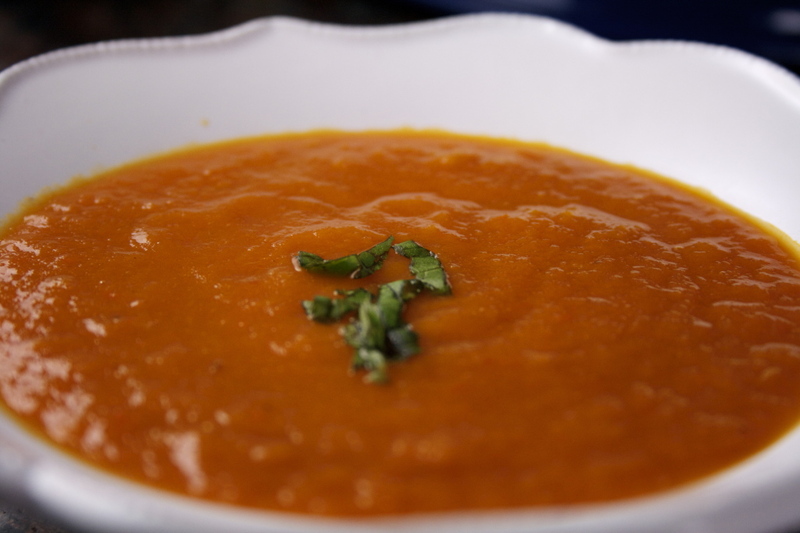 The time had come: five pounds of locally-grown beefsteak tomatoes, a couple of leeks and a bunch carrots were coming home with me on Wednesday to become roasted tomato soup. This soup is the perfect transition into fall comfort food: still fresh-tasting and light, with no cheese or cream, but thick, rich, and warming and perfect with a grilled cheese sandwich. It’s vegan, too – unless, like me, all you have in your pantry is chicken stock. It’s also easy: tomatoes are cored and cut in half, leeks and carrots are sliced, and garlic is peeled, tossed together with olive oil and a modicum of salt and pepper. It’s roasted for an hour before the tomato skins are peeled off the blistered fruit and the whole shebang moved into a pot along with vegetable stock and a bit of water. 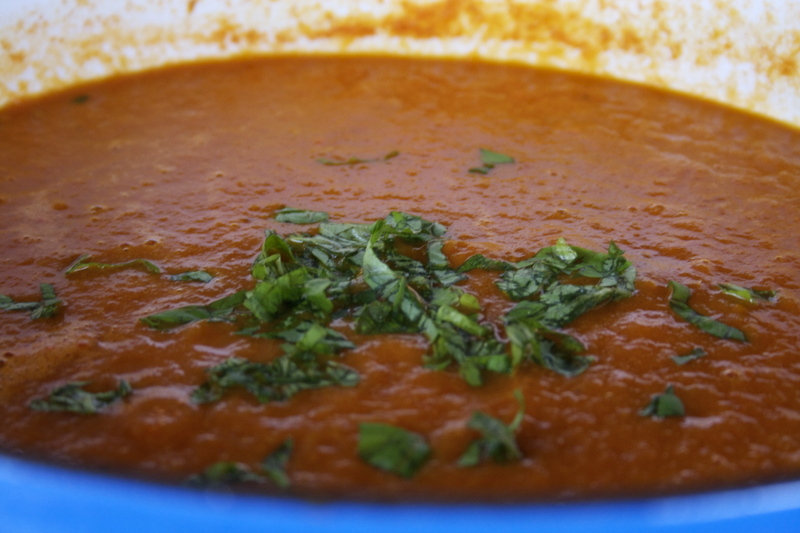 Simmered for 10 minutes, it’s then blended — with an immersion blender, if you have it (if you don’t – well, why don’t you? Stand-up appliances are dangerous! ), and then served with fresh basil. It’s incredibly hearty for a soup made solely with vegetables and broth. Roasting the vegetables pulls out the sugars, so it has a hint of sweetness, and the carrots balance the acidity of the tomatoes. 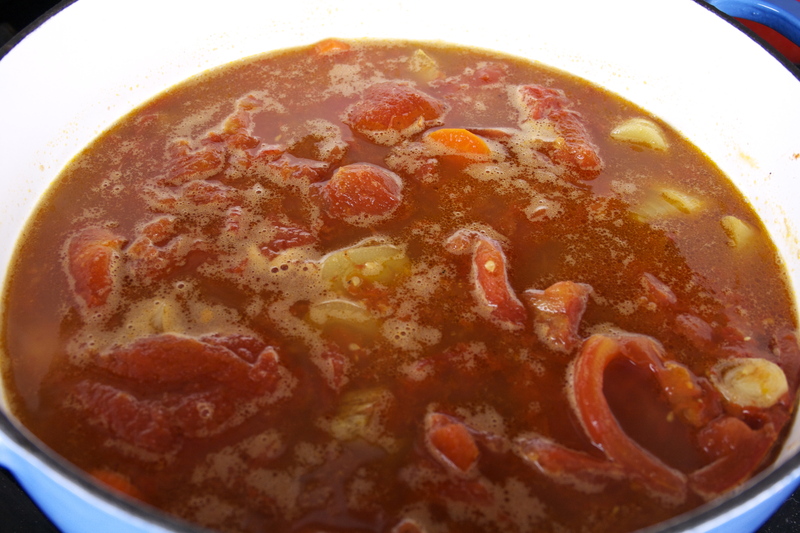 Thankfully, the recipe makes a startling amount of soup, which can be frozen in portions and defrosted later in the season, when those tomatoes (or, rather, the farmers markets) are gone. But if you’re looking at this in the winter, still, I encourage you to try it if you can find decent tomatoes, even if they’re Roma or vine. Just get the appropriate weight and it will still blend up into a delicious soup. There are 50-degree days ahead, 30-degree nights. I’m now ready to tackle them – and maybe reclaim some super human rights powers – with my favorite soup. Are you? Five pounds of tomatoes sounds like an awful lot, I know. You can definitely make do with less and just make a smaller batch of soup. 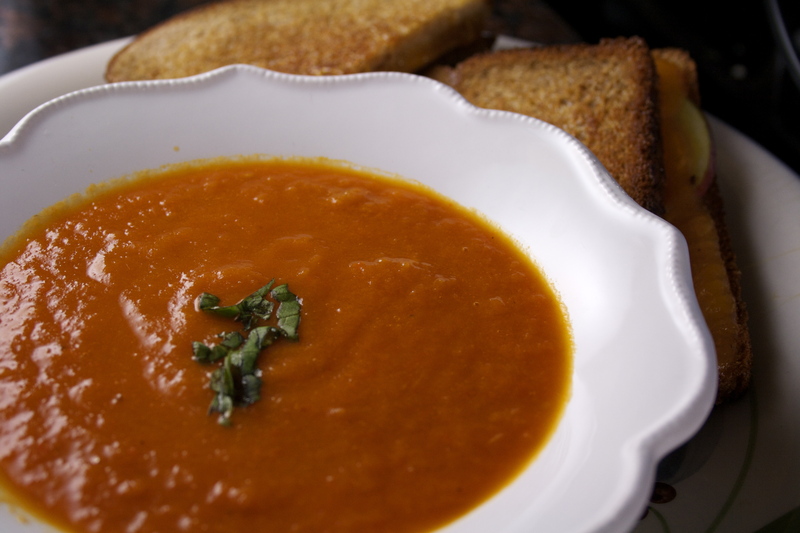 But of course for these kinds of recipes it’s always nice to make a huge batch, portion it out, freeze it, and have it ready to go when your grilled-cheese-and-tomato-soup craving comes on during a cold, blustery autumn evening. You can also amend the amount of liquid you pour in after roasting. 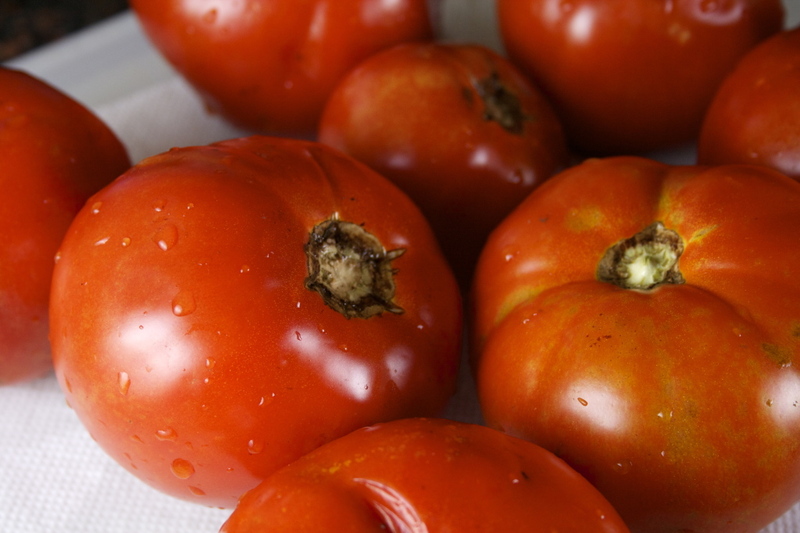 Four cups works for me with these tomatoes since they’re inherently both meaty (hi, beefsteak) and juicy, especially after roasting, but different tomatoes may yield less juice. If you’re using a regular blender instead of an immersion blender, be careful not to pour too much soup in at once. You don’t want disaster in the form of boiling soup on your hands or walls! Core your tomatoes and cut them in half. Slice white and light green parts of your leeks into 1/2-inch pieces. 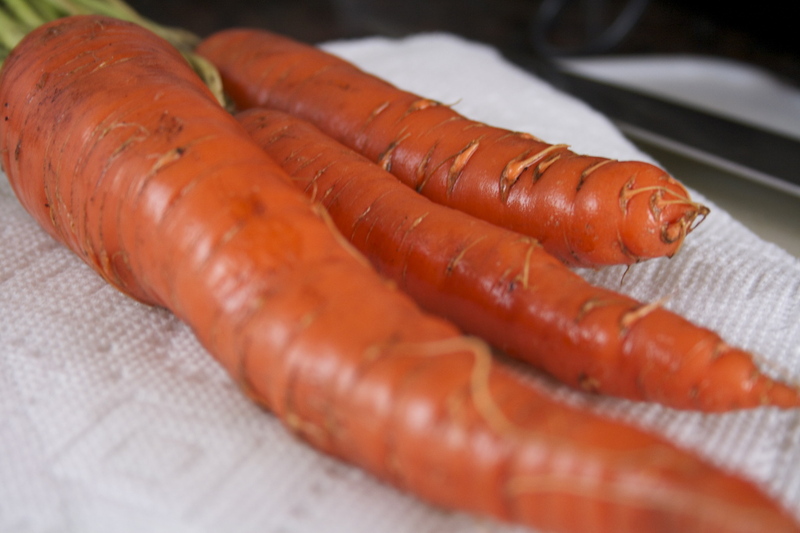 Peel and slice your carrots into 1/4-inch pieces. Peel your garlic. 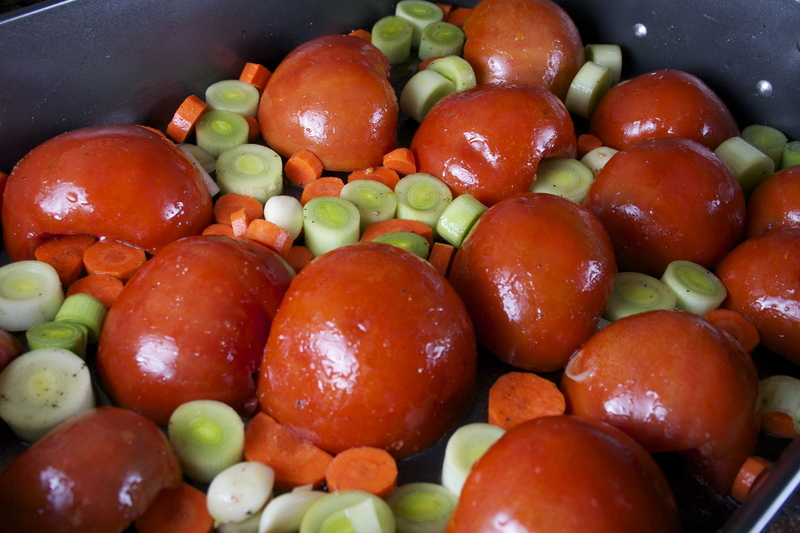 Toss all your vegetables in a large roasting pan with the olive oil, salt, and pepper. 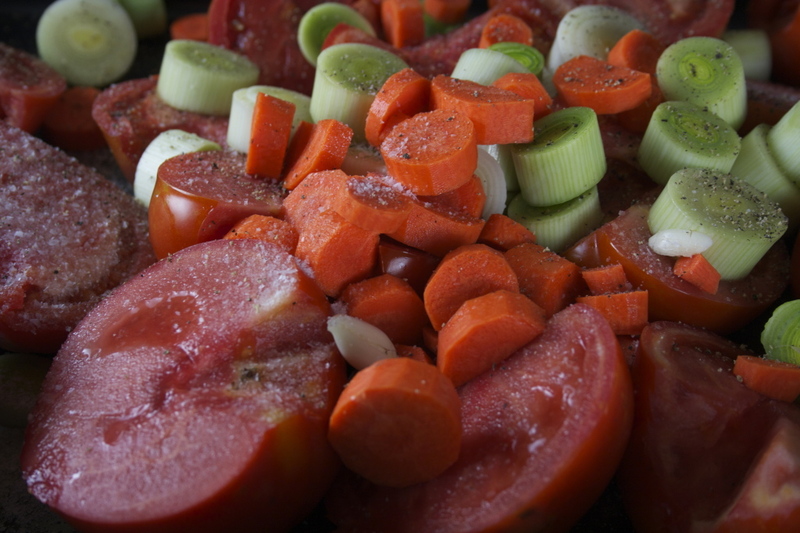 Once all the veggies are coated, form a single layer along the bottom of the pan, with the tomatoes cut-side down. This will help ensure the skin will blister, making it easy to remove. Roast for one hour. Remove pan from oven and use tongs to peel the tomato skins. Discard. 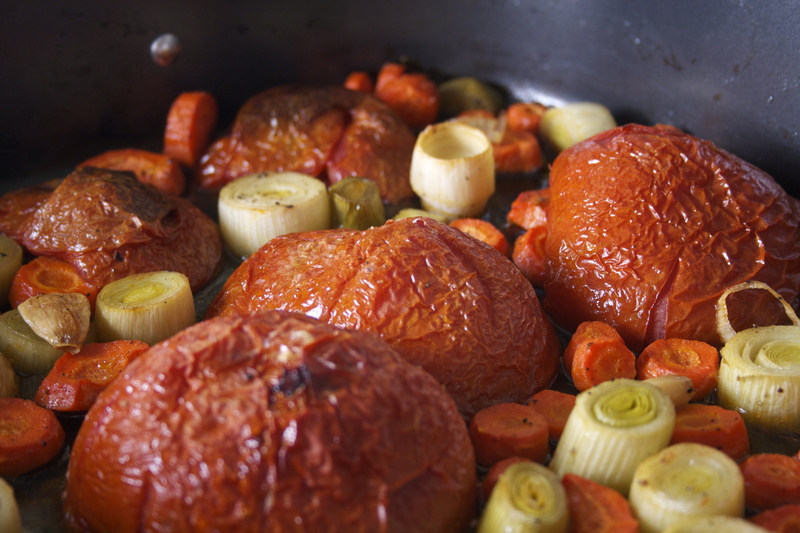 Move all your vegetables and their accumulated juices into a large stock pot or dutch oven. Add broth and water and bring to a boil. Lower the heat and simmer for 10 minutes. Remove from heat. 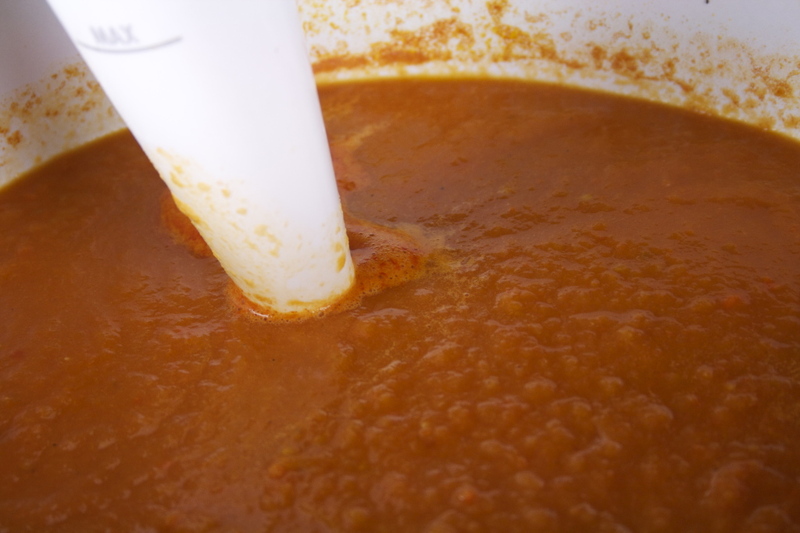 Using an immersion blender, blend your soup right in your pot. If using a regular blender, blend in small batches and return to pot. Add basil. 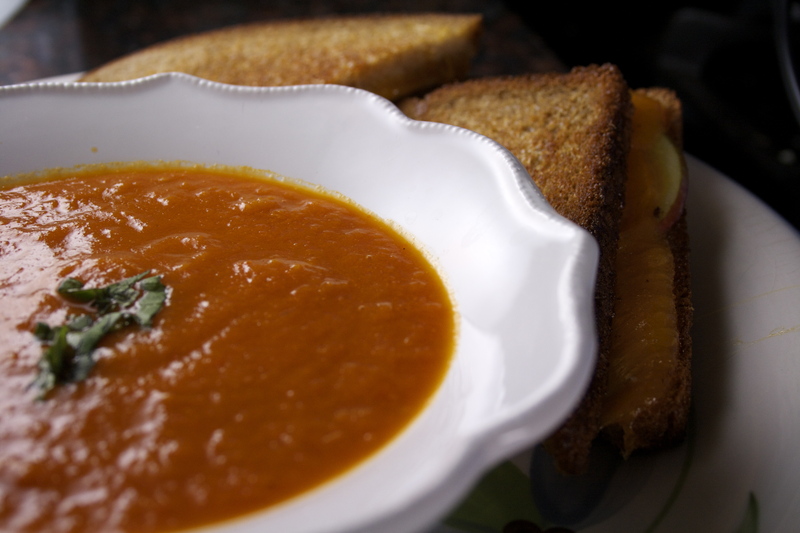 Serve – preferably with a gooey grilled cheese sandwich.